All clubs must send results and scorers for all games to the following numbers directly after a game finishes , 086-2656605 Secretary, 087-2373377 Pro , 087-6252952 Social Media/website . 7-30 Castleisland Afc v Tralee Dynamos , Venue Georgie O’Callaghan Park . 2-00 Kerry SBGL v Galway United , Venue Mounthawk Park . 2-00 Cork City v Kerry DL , Venue Bishopstown . 2-00 Castleisland Afc v Killarney Athletic , Venue Georgie O’Callaghan Park . 2-00 Listowel Celtic v Tralee Dynamos , Venue Pat Kennedy Park . 2-00 St Brendans Park v Ballyhar Dynamos , Moved to Tuesday 16th April . 7-00 CS Abbeydorney v Lenamore Rovers , Venue Mounthawk Park . 2-00 Kerry DL v Cork City , Venue Mounthawk Park . 2-00 Kerry SBGL v South Tipperary , Venue Mounthawk Park . 12-30 Kerry SBGL v South Tipperary , Venue Mounthawk Park . 11-00 Classic Fc A v Ballybunion Fc , Venue Mounthawk Park . 5-30 Annascaul Inch Utd v Kilmoyley Athletic , Venue Mounthawk Park Note the time change . 3-00 Rattoo Rovers B v Castlegregory Celtic , Venue Ballyduff Note the time change . 7-30 Castleisland B v QPR , Venue Georgie O’Callaghan Park . 6-30 Rattoo Rovers v Dingle Bay Rovers , Venue Ballyduff . Note: All Players Must be Properly Registered before they can Play in the KDL . Any clubs who have any genuine reasons for not being able to play any weekend must CALL the Fixture Secretary Mr. John O’Regan on Sunday evenings between 7.00pm and 8.oopm ONLY . Fixtures will be made at 8.00pm so their is no point in calling after 8.00pm on Sunday evenings . Fixtures will then be posted here and on the KDL Social Media pages while also being sent to the local press on Sunday nights or on Mondays on the odd occasion. Any issues with unplayable pitches will also be dealt with by the Honorary League Secretary Mr. John O’Regan on (086) 2656605 . ** No Metal Studs or Metal blades allowed on Mounthawk Park All-Weather Pitches , Any player who is reported by a match referee or a county board member for having the incorrect footwear shall be fined €5.00 for the first incident and this will be increased if they are found to continuously wear the incorrect footwear . Lights for night games in Mounthawk Park cost €50 to be paid by home team or split if teams agree to do so. The charge for using a pitch at Mounthawk Park without the use of floodlights is €25. Any club who books a pitch at Mounthawk Park and then cancelled their booking must still pay for the pitch . 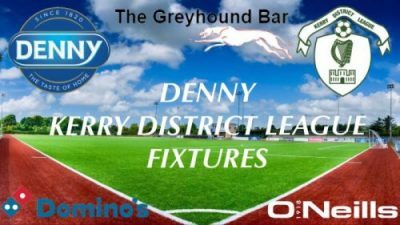 © 2019 Kerry District League.